Honda and NVIDIA have partnered up to supply future 2015 Civic, Civic Tourer and CR-V owners with a Tegra-powered infotainment system for them to totally not interact with while driving. The interface will be based on Android, but it's utilizing the aging (or at this point, we can just say old) build of 4.0.4. We may be excited to see Android work its way into more cars, but Auto, this is not. Aside from looking dated, ugly, and just like any other car infotainment system, there isn't much we can say about the actual UI. It hardly looks Google-y, though the app drawer icon in the bottom right corner sure seems familiar. 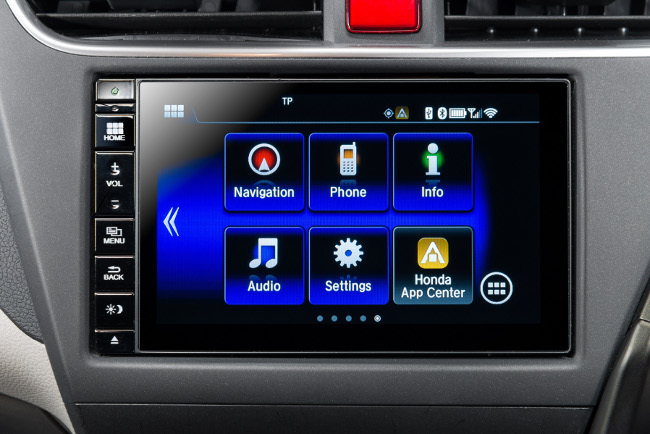 The 7-inch screen will show off a customizable homescreen with a Honda App Center supplying drivers with access to additional software. Expect to see stuff for music, podcasts, and general information, but don't go looking for games--you're supposed to be driving. Honda is the 19th global automotive brand to use NVIDIA processors for their infotainment systems, but it's the first based in Asia. The Honda Connect system will ship as standard equipment when it comes to Europe later this year. PARIS, FRANCE--(Marketwired - Oct 1, 2014) - NVIDIA (NASDAQ: NVDA) announced today that its NVIDIA® Tegra® mobile processor will power the new Honda Connect in-car audio and information system in the 2015 Honda Civic, Civic Tourer and CR-V, which will be launched in Europe next year. By integrating the Tegra automotive-grade processor, Honda becomes the 19th global automaker to utilize NVIDIA technology for in-vehicle infotainment applications. The announcement coincided with the first glimpse of these Honda models at the 2014 Mondial de l'Automobile (Paris Auto Show). "Honda is bringing NVIDIA's advanced mobile technology to an important new segment of vehicles," said Rob Csongor, vice president and general manager for Automotive at NVIDIA. "Inside these Honda models, the NVIDIA Tegra solution leverages Android to deliver an open, flexible infotainment platform. One that bridges the world of smartphone apps and the requirements of the automotive industry but, most importantly, does so in a way that makes driving safer."